A versatile stackable pallet cage designed for safe storage and transport of loose or packaged goods. The side panels are mounted to a standard 1165 x 1165mm pallet. Front drop down gate and rear hinged gate are both removable, and allow easy access even when stacked. 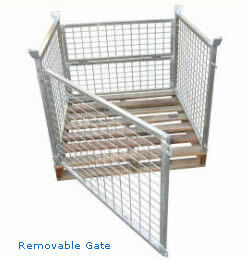 This pallet cage is supplied as a flatpack complete with hardwood pallet.